Otello, opera: Ah! mille vite...Si pel ciel marmoreo giuro! George Gershwin; Georges Bizet; Giacomo Puccini; Giuseppe Verdi; Jacques Offenbach; Vincenzo Bellini; Wolfgang Amadeus Mozart. Very Good. In very good packaging. 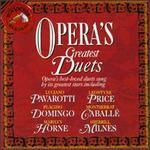 Opera's Greatest Duets. Very Good. Great shape. Audio CD Used-Very Good 1994mment. Fine. No longer factory sealed but disc, booklet, and jewel case are all in excellent/ like new condition. All items guaranteed, and a portion of each sale supports social programs in Los Angeles. Ships from CA.